FIGURE 7.7 (a) Effect of salinity on the freezing point and maximum density temperatures of seawater (Table 7.2). Note that with salinities above 24.7%o (parts per thousand), the freezing points and maximum densities of seawater occur at the same temperatures. (b) Freshwater with the density of water molecules (D), in grams per cubic centimeter, increases to a maximum at 3.98°C before freezing into the regular-spaced lattice of an ice crystal at 0°C. Modified from Thurman (1978). under less dense warm and fresh waters. These water masses, which are characterized by their distinct properties (i.e., temperatures, salinities, trace elements, gases, organic compounds, nutrients, and even species), underscore the mixing processes in the ocean. 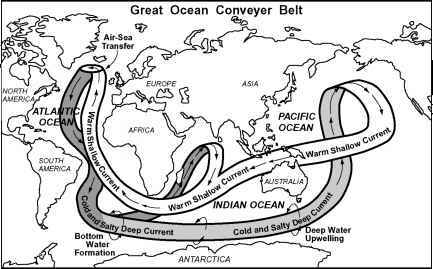 FIGURE 7.9 "Great oceanic conveyor belt'' that circulates through the Atlantic, Indian, and Pacific Oceans (with ocean volumes around 340, 280, and 710 million cubic kilometers, respectively). Cold and salty water masses in the deep sea originate in the North Atlantic and Antarctic (Fig. 7.8). Relatively warm and fresh water masses at the sea surface flow from the Indian and Pacific Oceans into the Gulf Stream and back to the North Atlantic, where this density-driven thermohaline (temperature and salinity) circulation is renewed. This oceanic conveyor influences weather patterns, particularly in the North Atlantic region and across Europe (see text). After Stommel (1958) and Broecker (1987). 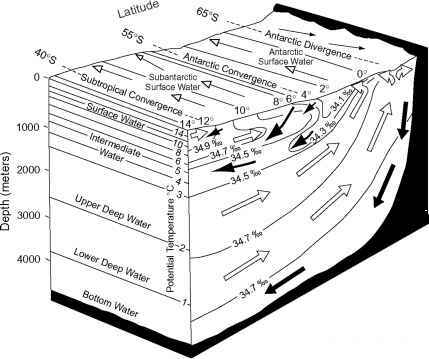 tions between the deep and shallow branches of the oceanic conveyor occur in regions where water masses downwell (in the North Atlantic and Antarctic) and upwell (around Antarctica as well as in the northern Indian and Pacific Oceans). An amazing feature of this thermohaline conveyor is its role in weather patterns, particularly in the North Atlantic region. In fact, one of the most striking anomalies on the Earth is in Europe, where temperatures today are 10 to 20°C warmer than at comparable latitudes in North America or Asia. Underpinning the exceptionally warm temperatures of Europe is the 1015 watts of heat—nearly one-third of the total solar heating over the entire North Atlantic—that are transported poleward with the Gulf Stream. In addition to heating Europe, warm Gulf Stream waters evaporate when they come in contact with cold air from the Canadian Arctic. This evaporation raises seawater salinities to the point that surface waters become dense enough to sink into the deep sea. As this North Atlantic Deep Water moves southward toward Antarctica, it is replaced on the surface by the northward-flowing Gulf Stream. This connection between surface and deep-water flows—like a conveyor belt— suggests that the Gulf Stream heating of Europe could be diminished by reducing deep-water formation in the North Atlantic. FIGURE 7.8 Vertical profile of the temperature, salinity, and depth characteristics of the major water masses in the Southern Ocean (Fig. 8.3). From bottom to top, the major water masses include the northward-flowing Antarctic Bottom Water (solid arrows), southward-flowing North Atlantic Deep Water (open arrows), and northward-flowing Antarctic Intermediate Water (solid arrows) which are predominant features in the world's ocean (see text). Modified from Knox (1970) and Berkman (1992). its last breath from the atmosphere—North Atlantic Deep Water has extremely low oxygen concentrations and radiocarbon ages that exceed 1000 years. 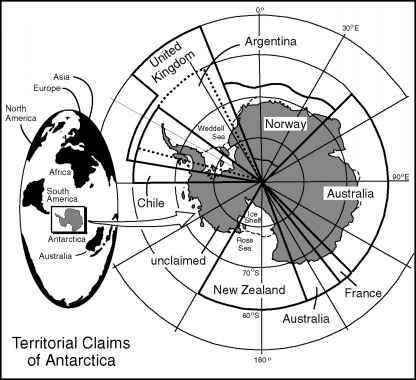 As it upwells at the Antarctic Divergence (Fig. 7.8), North Atlantic Deep Water also carries carbon, nitrogen, phosphorus, silicon, and other nutrients from plants and animals that had dissolved in the deep sea. This divergence is like a giant fountain pumping nearly 50 million cubic meters of nutrient-rich water per second from the deep sea into the Antarctic marine ecosystem (Chapter 9: Living Planet). The Younger Dryas is a notable example of a shutdown in the thermohaline circulation that was triggered by a meltwater lid over the North Atlantic following the deglaciation phase after the Last Glacial Maximum (Fig. 7.6). The ensuing cooling period, around 11,000 years ago, returned northern Europe into a glacial condition for nearly 700 years. There also are indications that the impact of the Younger Dryas was global with concurrent cooling in many other regions on Earth. Apparently, such climatic flip-flops in the North Atlantic region have been an ongoing phenomenon since the Last Interglacial period, nearly 110,000 years ago (Fig. 7.4). In ice cores from Greenland, more than 20 climate warming intervals (Dansgaard-Oeschger events) have been inferred from elevated concentrations of carbon dioxide [Eq. (1.1)], which is a well-mixed gas in the atmosphere that reflects global climate changes. Ice-rafted debris in the sediments (Chapter 6: Spreading Planet) indicate that there also have been periodic iceberg discharges (Heinrich events), with accompanying meltwater pulses and subsequent cooling intervals in the North Atlantic every few millennia. The overall implication of these offset warming and cooling records is that climate oscillations are driven internally within the Earth system by ocean-atmosphere dynamics as well as externally by orbital relationships with the Sun (Figs. 2.2, 7.2-7.4).